Indian’s 1,133cc Scout engine is a gem, which we verified in our test of the Victory Octane (which utilized a version of that engine). An engine that deserves to be in a performance-oriented chassis. Enter the Scout FTR1200 pictured in this article, a custom unveiled by Indian at EICMA last week. 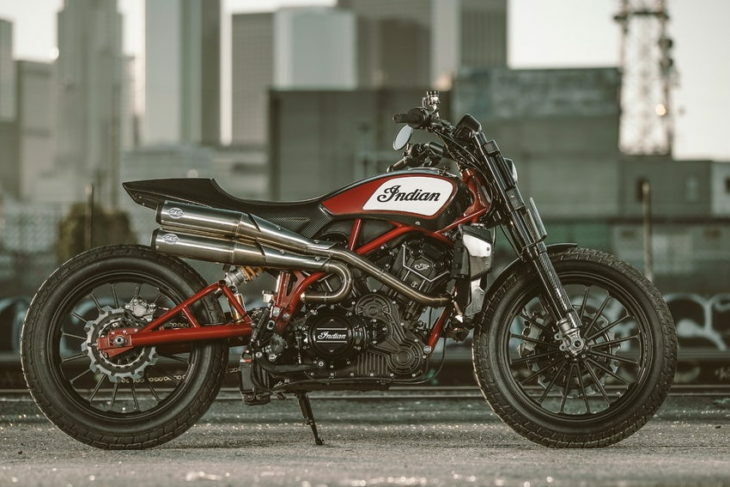 It looks very much like the FTR750 that Indian used to dominate the American Flat Track Championship this year. 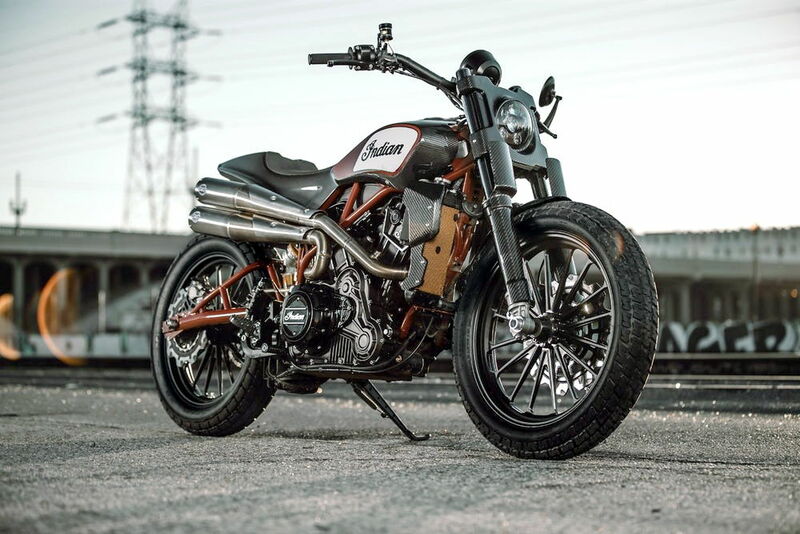 Indian hinted at the show that the FTR1200 could lead to a production model in the future. The concept itself is stunning — with LED lights and carbon fiber body parts throughout, the FTR1200 also features Brembo brakes and Öhlins suspension. The custom S&S exhaust and RSD Traction wheels round things out. As you can see in the video below, this engine has some serious performance potential. We say Indian should build a street-legal version ASAP. What do you think? In a heatbeat, Indian would have my deposit as soon as it got the green light. Absolutely LOVE IT! Please ship to Australia ASAP. 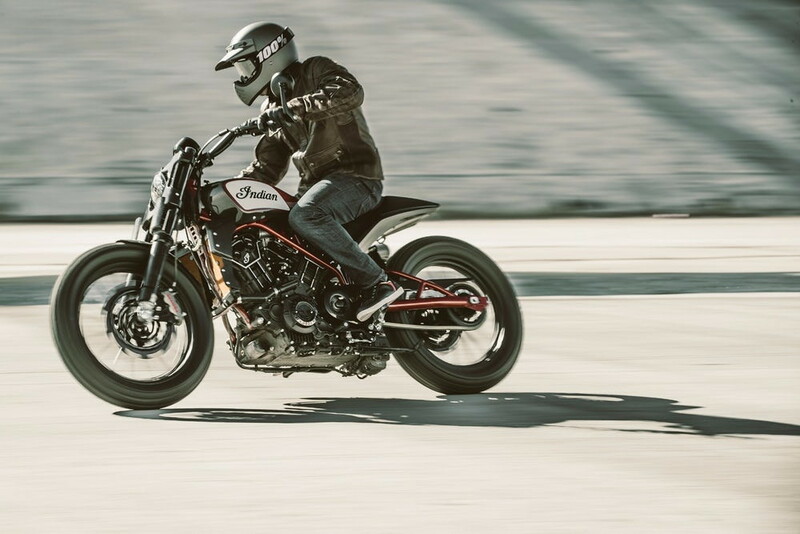 The market for such a bike is crying out for Indian to open up another genre of bike for the large percentage of riders that don’t want a cruiser. We have had the cafe racer revival back in the early noughties. Then came the Scrambler and so it’s now time for obviously the Tracker. The appeal of this bike is it’s pedigree and heritage, such an iconic motorcycle brand that has a rich and glorious racing history. 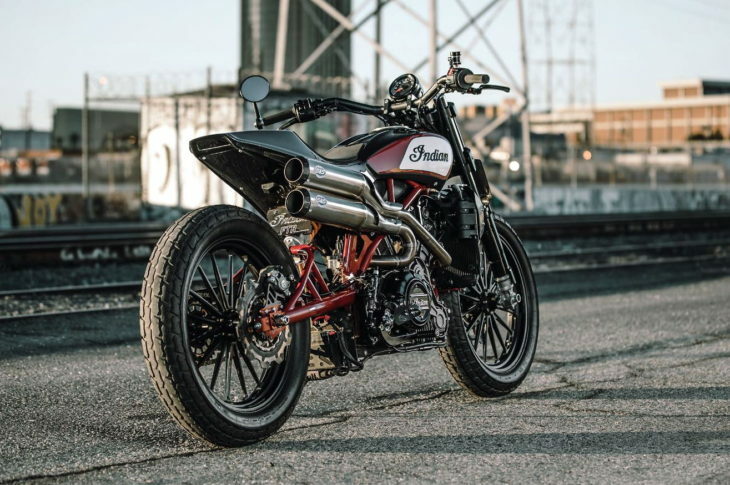 Indian motorcycles have always been beautiful in design and their revival in American flat track racing and recent success is the perfect time to launch such a desirable bike. I honestly cannot imagine any other bike to be this appealing in the last 30 years. Bring it to the masses and WE WILL BUY! Indian are you listening? Don’t hesitate, seize the moment and you will resurrect Indian to unimaginable heights with this product. JUST DO IT. I’m holding my breath and so are all my fellow riding mates for an early 2018 surprise launch. I need to see it with the tail light, license plate holder, illum. light and rear turn signals in place before I bite, but it looks great so far…Too bad those great looking pipes probably won’t make it onto the street version! Saw the bike at the NYC show . It’s absolutely beautiful, would buy it in a heartbeat. Spoke to Indian rep. and asked about if and when it would go into production. Indian rep pointed to the people in there area and said probably wont go into production. It’s not there demographic. If that’s how they are looking at it they will never grow there brand. Hopefully this rep didn’t know what he was talking about. A Victory rep told.me the exact same thing when I asked about a possible model fashioned after the Project 156. It isn’t what their customers want. They would never make anything but cruisers. And they didn’t. Good looking and looks like it will hold its own. I truly hope it comes to production. 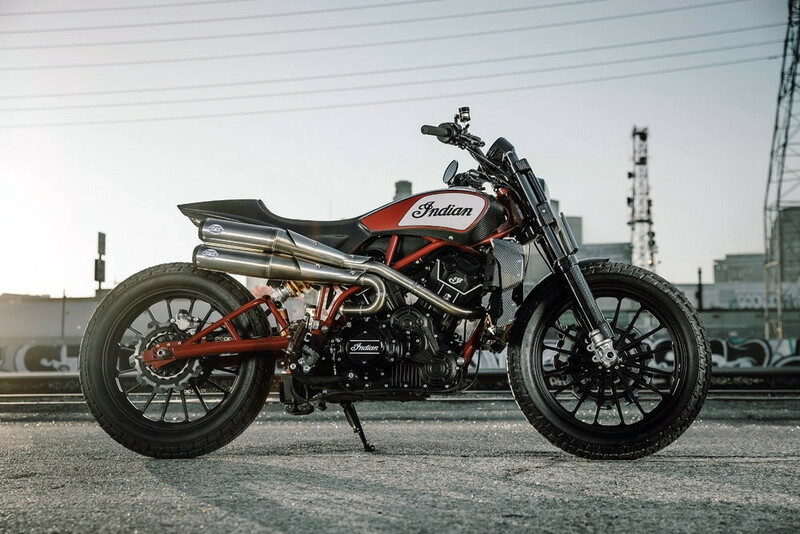 I’m 67 years young and have been around motorcycles since I was 12…had all the British brands, numerous model HD’s, road bikes, dirt bikes, choppers, boy racers and the like, but all I have to say about the Indian FTR1200 is, “This is a motorcycle in it’s purest state possible”. I would seriously consider trading my Moto Guzzi Griso 1100 for this Indian. Put a light weight trellis girder fork (red like the frame) on it and I’m all in! I do like the front down tube casting with the integrated radiator of the Scout. That is a piece of art. I’ve been looking for a broomstick just like this. Please give it at least 4.5″ of suspension, and a tank range of 150 miles, or you can keep it. I get excited about this bike and then I realize that is likely less than a 10 litre tank. So much gets lost on the way to building a practical streetbike. 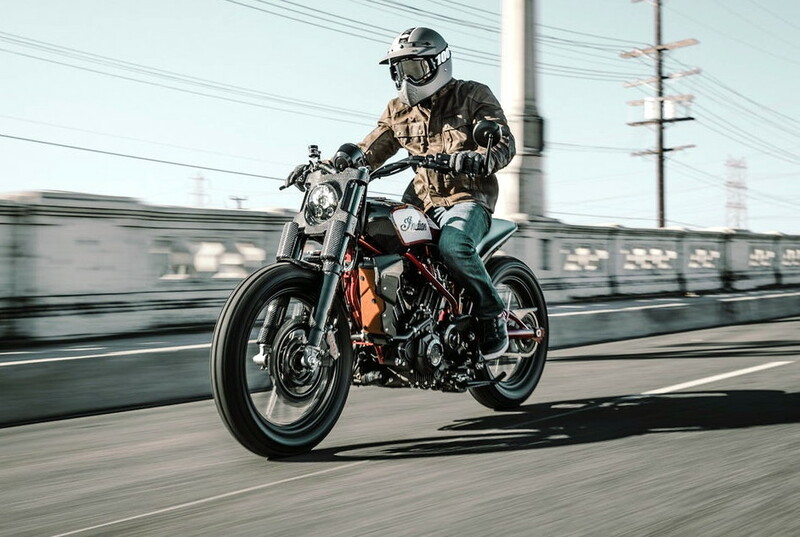 KTM’s new Duke 790 for instance….